It’s the third day of camp and that means 4 more new classes! The girls woke up on this chilly morning at Camp Merri-Mac, ecstatic to start this new day! After we all finished our chores making our cabin neat and tidy, we headed down to Tucker Inn to enjoy some french toast with and sausages. Yumm! Every girl at the table was chatting about which class they are most excited for today! At chapel this morning, Molly C. told us a story that reflects God’s presence in every situation and how he will always be there to get you out of your hard times if you have faith in Him. With most campers having never experienced climbing up a climbing tower, when they reached the top they can feel the immense joy in their achievement. Not only that, but the view from the top of the tower is the best view at camp! You can watch the mountain biker’s training on the open green below, the girls in yoga focusing on their stretches, or the other girls practicing boulder climbing below. You feel as if you are on top of the world and that you can do anything! Kristie G. is a climbing instructor here, this is her 13th year at camp. When asked how she got into climbing and why she teaches climbing at Camp Merri-Mac, Kristie responded: “ I got into climbing when I first came to camp Merri-Mac, and the reason I teach climbing at camp now is to help these girls become great climbing instructors too.” Ella C. was a little nervous to repel down the climbing tower but when she was half way down she said “Oh this isn’t so bad.” It was a beautiful sight to see a young girl overcome her fear! As the lunch bell rang we all enjoyed ham and cheese sandwiches and a second serving or three… of mac & cheese! It was delicious! Then to wrap up lunch we all sang 3 of our tribe songs. “Seminole pride, woot woot, Seminole power!” (can you tell I’m in the tribe Seminole?). After lunch every girl was ready to have rest time to either nap or write letters to their loved ones. At 2:00 when the bell goes off, then they spring out of bed to trading post to get their favorite candy! We also were able to enjoy free swim during free time today! A lot of girls enjoyed trying the blob, canoeing, and jumping off the diving board. Then after free time it was off to our last two classes of the day! At dinner we enjoyed pieces of chicken with cooked veggies and a piece of cake with chocolate frosting on top! Everyone was wanting a second dessert! Then we sang all our cabin songs and we got ready to hear how to play our evening activity Gold Rush! We were all very excited to play Gold Rush! 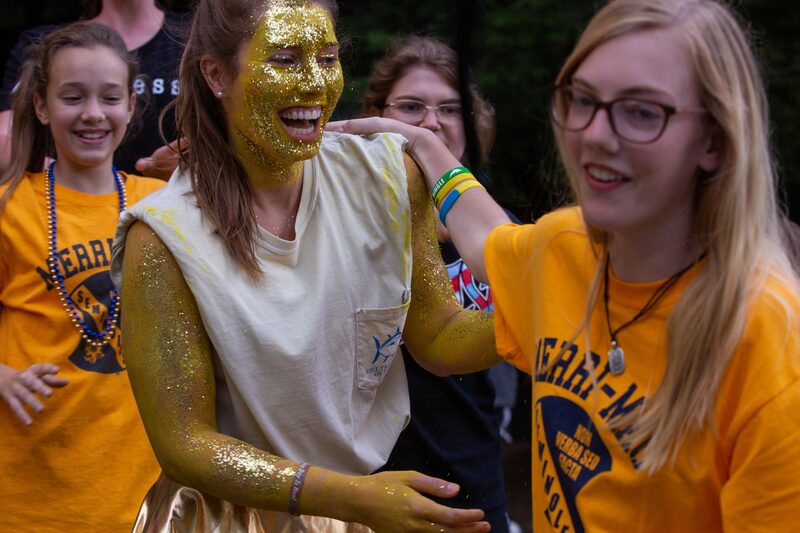 The campers get to run all around camp looking for gold items!. The counselors participate as bandits and try to find the gold before the campers do. Everyone is so excited to find the gold first so that their tribe can win!